You don't need to register the software for it to work. But does unlock a few more functions. Besides, it's so inexpensive you might as well go ahead and pay the registration fee if only to encourage them to keep making it available. Once you've got a working copy installed on your computer, the next thing you'll need is a model to print out. If you're not a 3D modeller, you can find 3D models everywhere. The Tamasoft website has a gallery of models you can download for free, there are countless prop and costume forums where members are willing to share models for use in Pepakura builds, and if you have the appropriate conversion plug-ins, you can even use models from the Google Sketchup 3D Warehouse. When choosing (or designing) your model, you have to weigh the complexity of the build against the amount of time and resources you'll have to spend making it nice and smooth. A high polygon model will be harder to assemble in the paper stage. A low polygon model will take more work when it comes time to fair it out. In this case, I've decided to build a high-poly model made by ObiWan of the 3D heretics forum which I found on the 405th, but you can download it here. Pictured above is a well-lit work area with the pages of the pep model printed out on 110-lb card stock, a shiny, sharp hobby knife, cyanoacrylate adhesive and accelerator, a cutting surface that isn't the tabletop (or your lap), a computer with the model open in Pepakura so you can keep track of what you're doing, and another screen where you can watch a movie or listen to music or something else to distract you from the mind-numbing repetition of building a pep model. Finally, whatever kind of beverage you'll need while you're working. Not pictured: spare blades for the hobby knife and Band-Aids. When I'm building a pep model, I find it's easier if I don't cut out the parts until I'm actually ready to use them. I keep all of the printed sheets in order and use the "Check Corresponding Face" function to find the parts as I go along. If you cut all of the pieces out beforehand, you've basically just bought yourself the world's most insane 3D jigsaw puzzle. As I cut the pieces out, I also use the knife to lightly score the fold lines so they'll crease easily. It's important to go along the center of the line and cut everything as precisely as possible. When building a paper model like this, errors compound, so a few misalignments early on will make for big weirdnesses later on. To glue the pieces together, I use Insta-Cure. It's a cyanoacrylate adhesive just like Zap-a-Gap or Krazy Glue. I like it because it cures in a matter of seconds (or instantly if it contacts your skin) and can be catalyzed with a separate spray bottle if you don't like waiting. I don't like waiting. The main drawback to this type of glue is that you will glue your fingers to your work. Guaranteed. Once assembled, the next thing you need to do is to reinforce it so it won't be crushed the moment someone looks at it the wrong way. 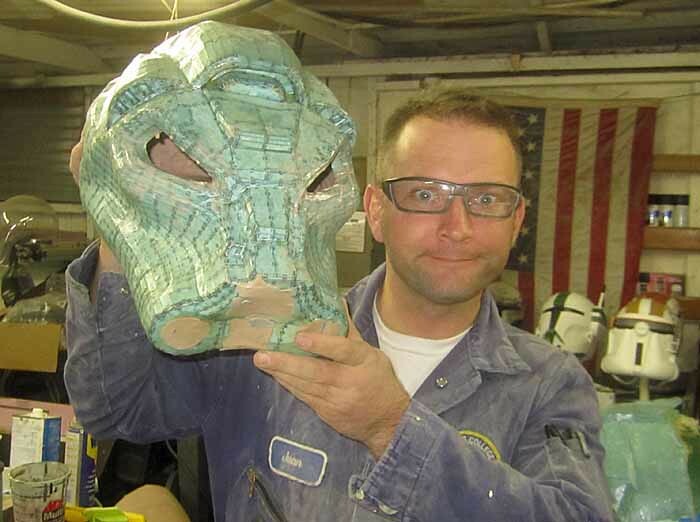 This is time for fiberglass resin, which you can get at your local hardware store. You'll also need a disposable container to mix your resin in as well as a disposable brush to spread it onto the surface. Muster your tools, take a deep breath, and read the label on the side of the fiberglass resin can. That done, find an area outdoors or with plenty of ventilation so you aren't overcome by fumes from the resin. It's also a good idea to get a respirator designed to filter out organic vapors so you don't make yourself stupid by huffing resin stink. Now it's a bit stiffer, but it's not all that strong. You've got two options to strengthen it: fiberglass mat or "Rondo." Fiberglass mat requires a bit of skill, patience, and know-how, so I'll save that for some other article. 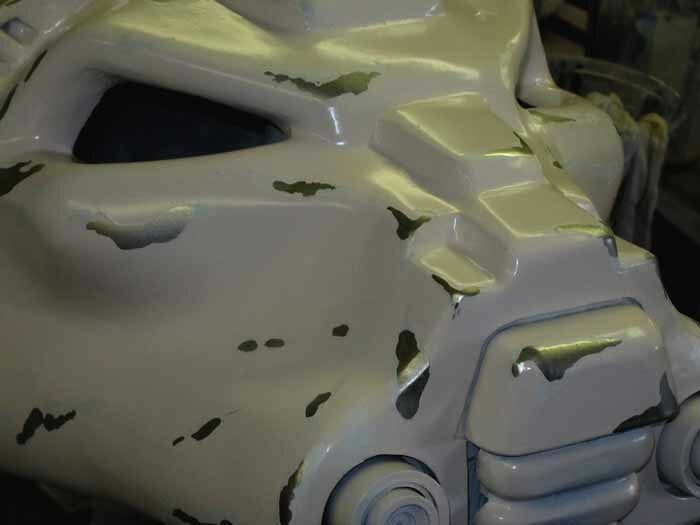 Rondo is a blend of fiberglass resin and Bondo auto body filler. Resin on its own is brittle. 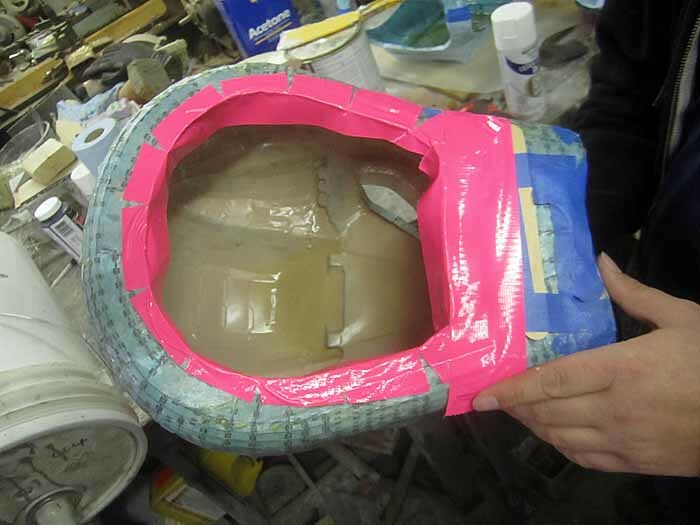 Bondo on its own is very thick and hard to slush around. Mixing the two of them makes a readily spreadable composite that's rock hard when it cures. Lots of makers will swear by their particular blending ratios. You'll want to experiment to get a thickness that you're comfortable with. If you want it runny, use more resin. 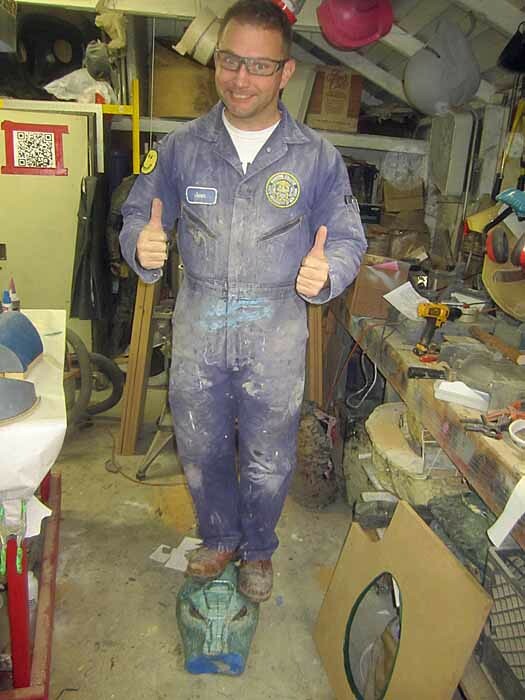 If you want it thicker, use more Bondo. Experiment to find what works for you. Just make sure you only mix up as much as you can use within about five minutes before it hardens and becomes a useless lump that you've got to chisel out of your mixing container. It's a good idea to have a few mixing containers handy too. 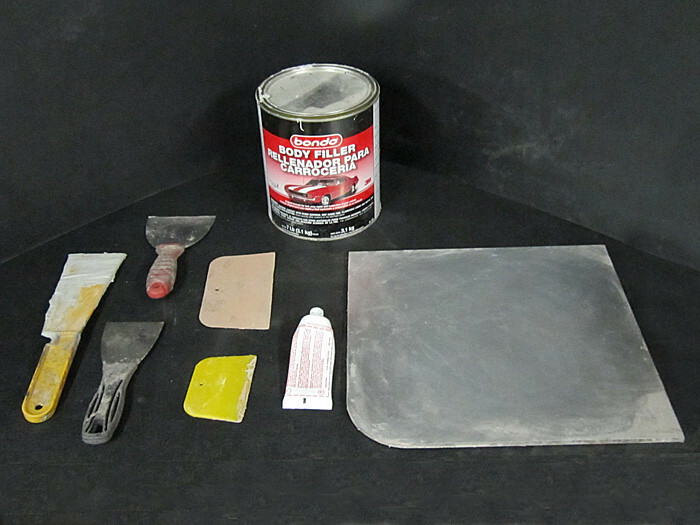 Shown here in the front row is a tool for scooping Bondo out of 1-gallon cans, two sizes of putty knife for mixing and spreading Bondo, two sizes of flexible spatula for spreading Bondo, a chip brush for spreading Rondo, tongue depressors for mixing resin, and a nice clean smooth surface for mixing Bondo. 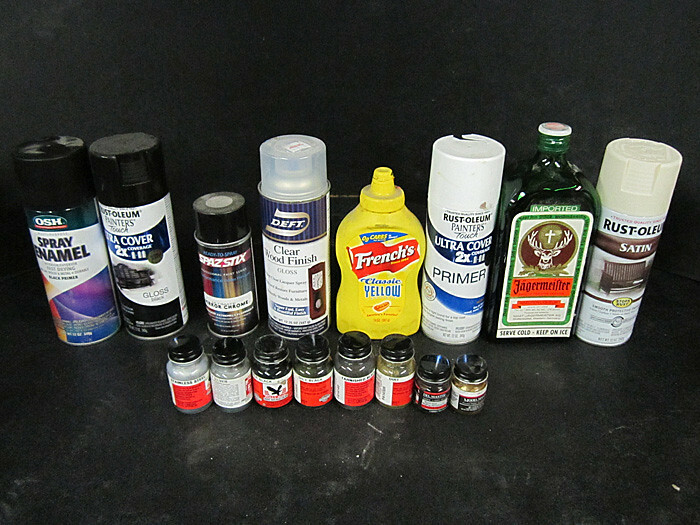 In the back row is the can of Bondo, a can of resin, and a 1-quart graduated mixing cup. You won't need gallon cans for a project of this size, but I go through a lot of both products, so that's that. 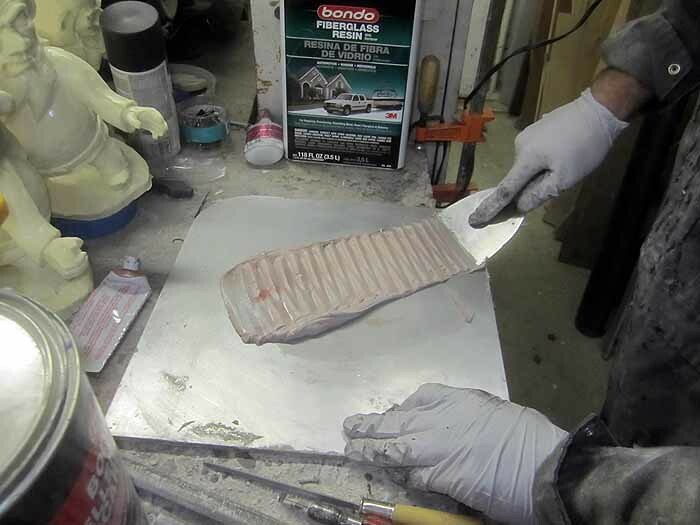 Don't use the same tool you use to mix the Bondo or there's a chance you'll contaminate your Bondo with hardener and have it slowly turn into garbage. For a helmet this size, you'll only want to take out a couple of blobs the size of golf balls. Or one blob the size of a baseball. Or two-thirds of a blob the size of a softball. It's not an exact amount, but you'll get the hang of it with practice. 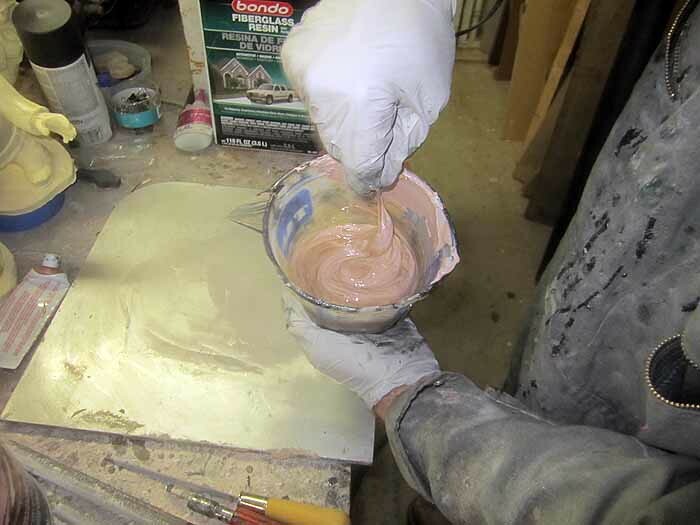 The reason for skimping on the hardener is to allow yourself a bit of extra mixing time before the material cures. 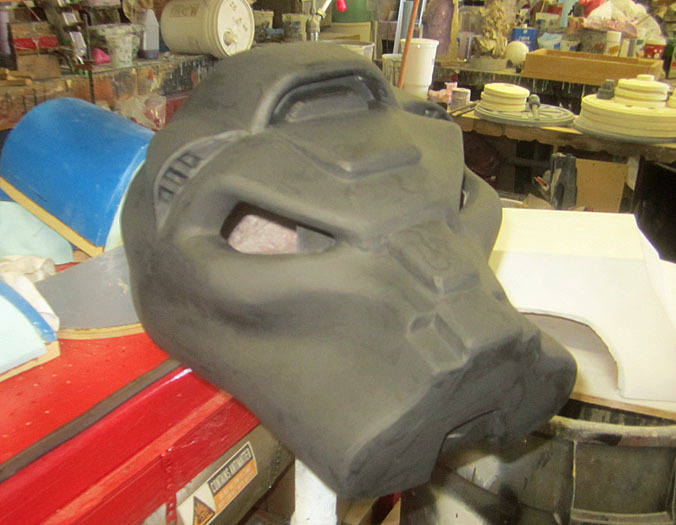 Remember, you'll have to mix up a batch of fiberglass resin too, so you don't want the bondo to harden too quickly. 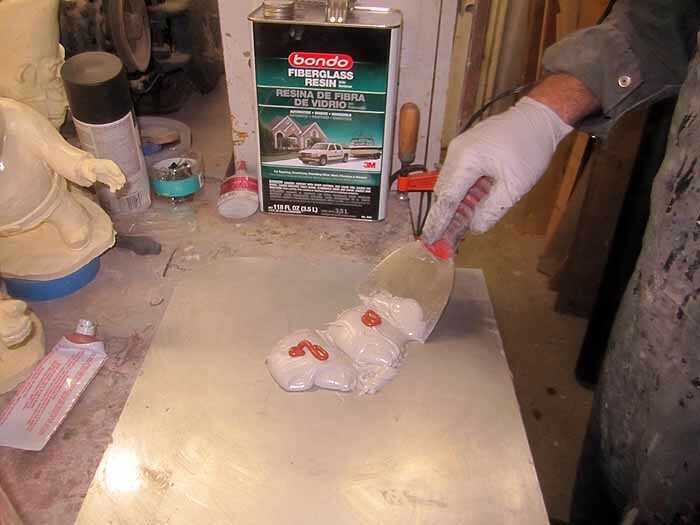 Only let the Bondo touch one side of the putty knife so you can control where it goes. 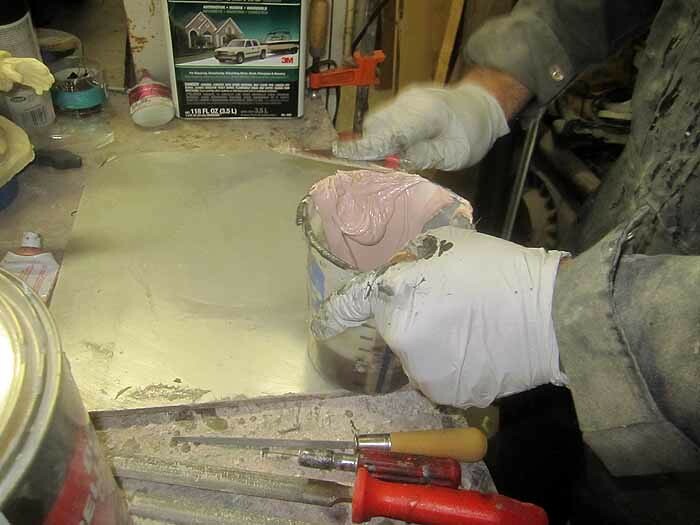 While mixing, periodically scrape the Bondo off of the working side of the putty knife so it can be blended back into the rest of the material. 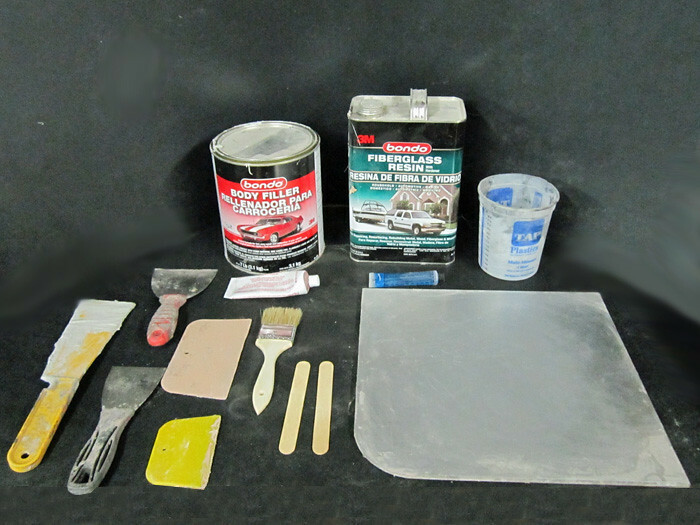 Scrape the Bondo off of the mixing surface from time to time as well. 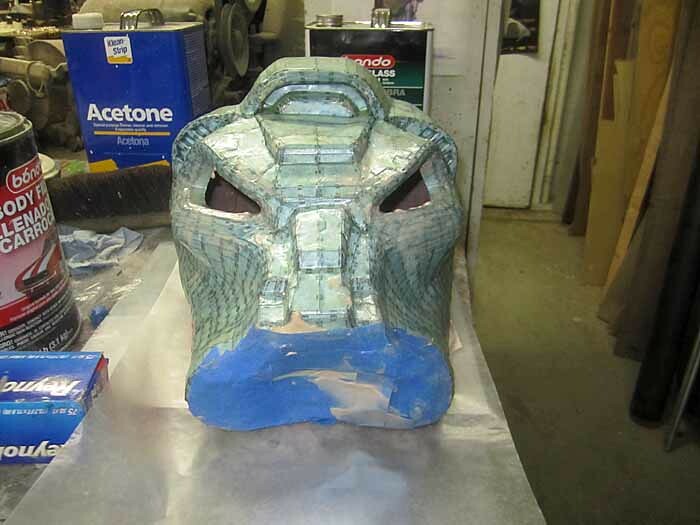 Continue mixing and scraping and folding the Bondo back into itself until it's all one uniform color. Make smaller batches, when you sand it all off you won't waste as much time and money filling the workspace with pink dust. That last one is apopros of nothing. It just comes up a lot. When it's mixed thoroughly, you've got yourself a blended goop with a viscosity somewhere between milk and mayonnaise, depending on your mixing ratio. 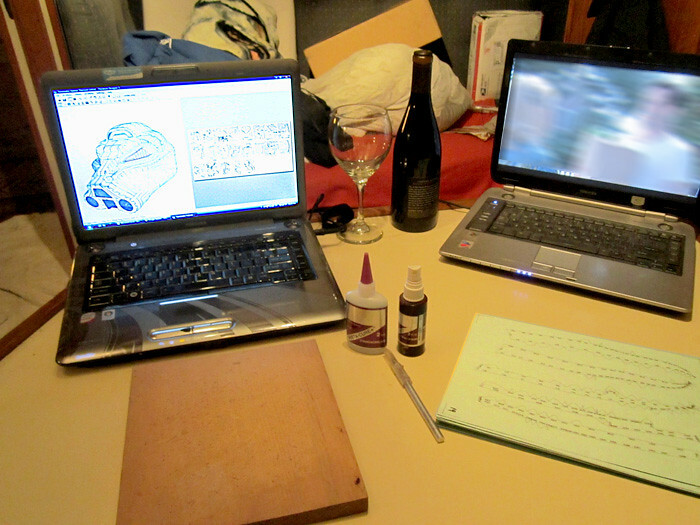 During this stage of the project, you are guaranteed to have at least a little bit of liquid Rondo drip out somewhere. Make sure you cover the floor with your finest antique Persian rug to soak up any spills, then leave it where it is until the Rondo has cured and it glues the rug to the underlying floor. 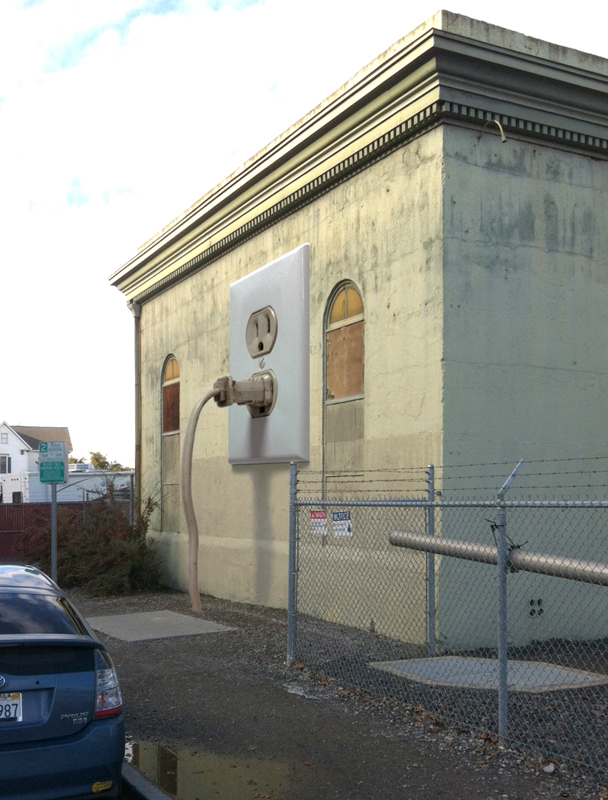 There is no trickery involved in this picture. That's all 175 pounds of me plus steel-toed boots, heavy coveralls, and pockets likely filled with sanding dust and used rubber gloves standing on top of this paper helmet. I may have overdone it with the reinforcement, but it gives you an idea of what's possible. Now you've got yourself a nice, strong helmet. You shouldn't wear it for motorcycling, but it will hold up to the rigors of costuming. With that done, the next step is to smooth the outside so it stops looking like a multi-faceted 3D model and starts looking sleek. 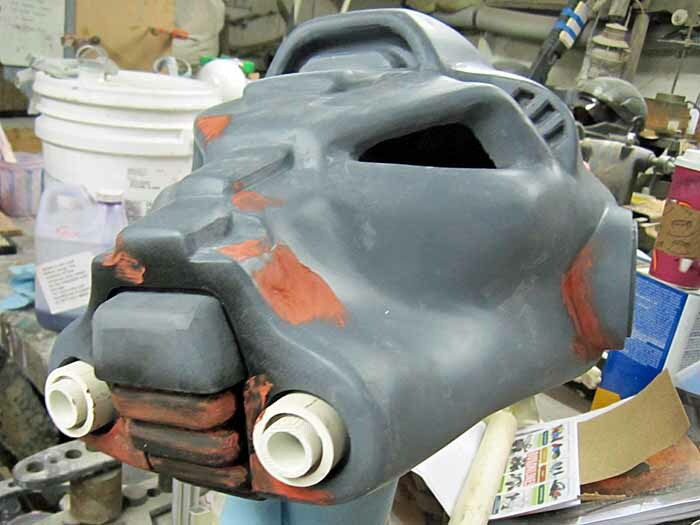 This is a job for Bondo body filler. If you're paying attention, you've noticed that these are basically the same tools that you used in the Rondo phase, minus the fiberglass resin, tongue depressors and mixing cup. With a model that's already fairly smooth, you shouldn't need very much filler to fair out the shape. If you're using a low-polygon model, you'll need more to round out the facets. In either case, you need to resist the urge to pile on a lot of material that you'll need go grind down as soon as it cures. Instead, it's easier (and less messy) to build up several small layers and cut down on the amount of sanding you'll have to do. 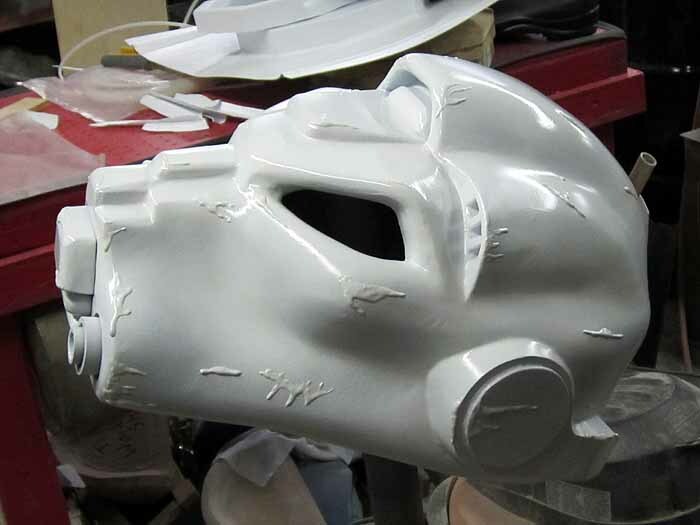 After that, it needed more Bondo. Then more sanding. 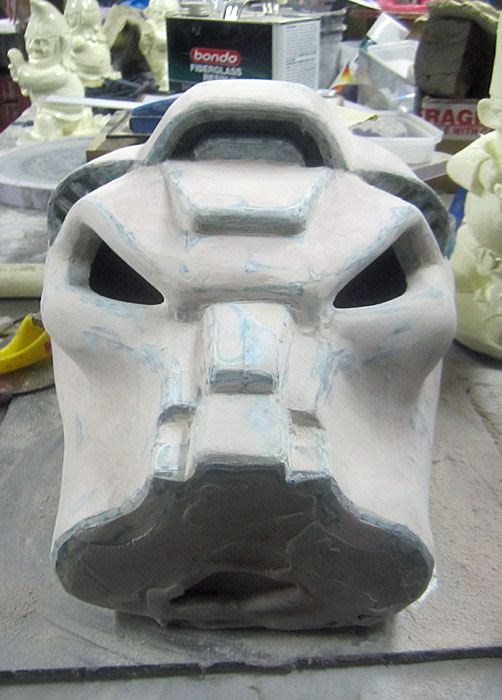 Then more Bondo. Then more sanding. 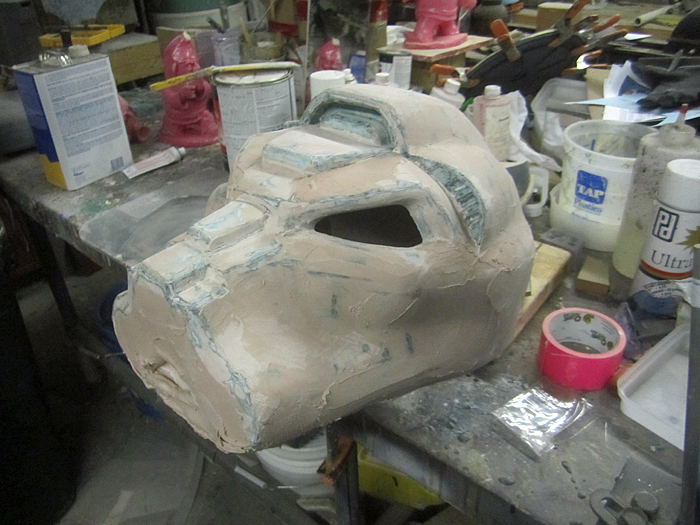 Then more Bondo. Then more sanding. Then I slowly descended into a downward spiral of smoothing and shaping that I may never have recovered from if not for the timely intervention of friends and family who were able, after a lengthy and emotional intervention, to convince me that it looked "pretty good." 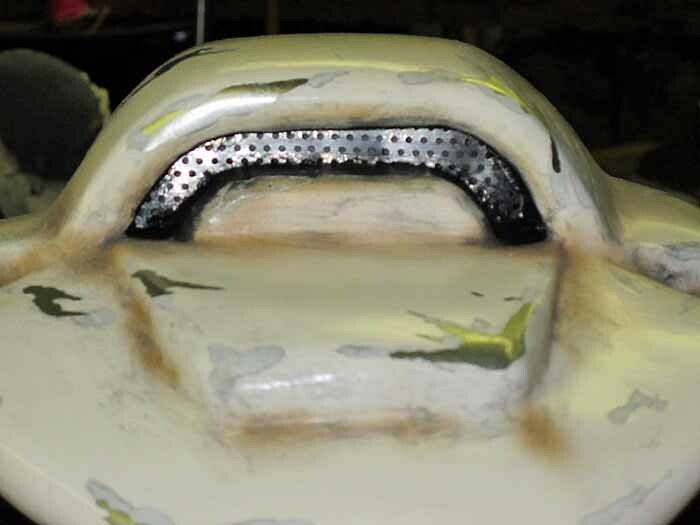 Most of the flaws at this point could be fixed with "Glazing and Spot Putty" another automotive product available at your hardware store designed to fill in pinholes and tiny scratches before spraying on your paint. With all of the small pits and pinholes filled in, you'll need to add the detail bits. The rust-colored patches are areas that I touched up with more glazing and spot putty. Because I can't leave well enough alone. 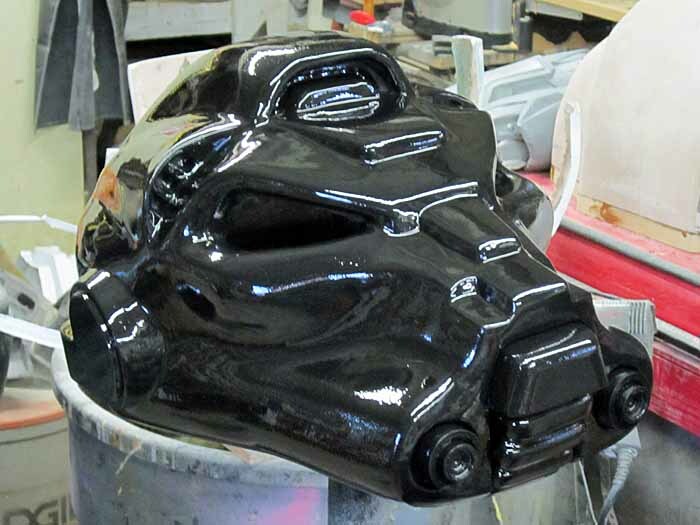 After yet another coat of primer, it's time for painting! Per the mythology associated with this character, this helmet would be hundreds of years old, a cherished relic passed from generation to generation but still subjected to the rigors of nearly constant combat. I wanted it to look like it was white when it was new, but aged and battered while still being well cared for. 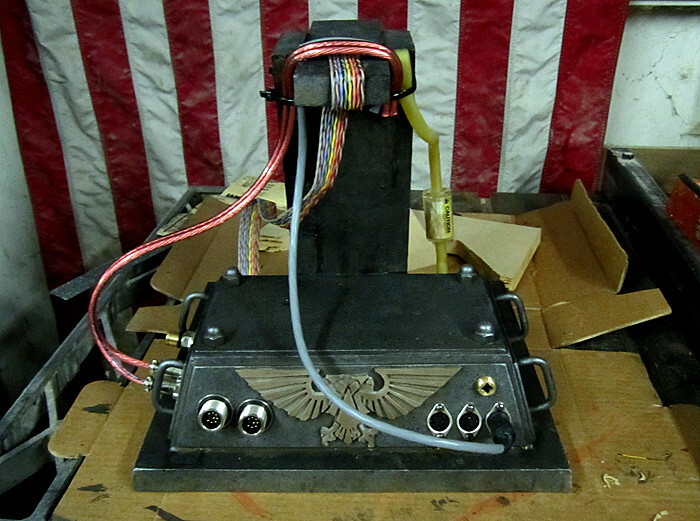 There are countless methods for finishing a prop like this. The important thing about this build is that I wanted to be able to tell people that it was made of paper and have them call me a bold-faced liar. 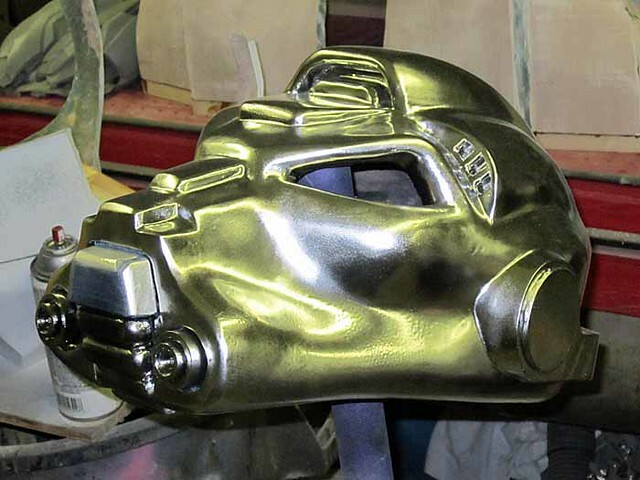 The best way to achieve this desired effect is to make it look as convincingly metallic as possible so that simulated scratches in the finish will seem to show bare metal. Yes, mustard. Also known as French's Classic Yellow Mustard or "ew, gross, how long has this been in your shop?" I use mustard because I was able to determine through a months-long series of clinical trials that it has just the exact right pH balance to counteract the corrosive activity caused by the solvents in the spraypaint. Actually, no that's not true. In reality you can get away with anything viscous enough to stay where you put it. Ketchup will probably work. Salsa Verde will probably not. The point is to use something water-based that the oil-based paint can't stick to. 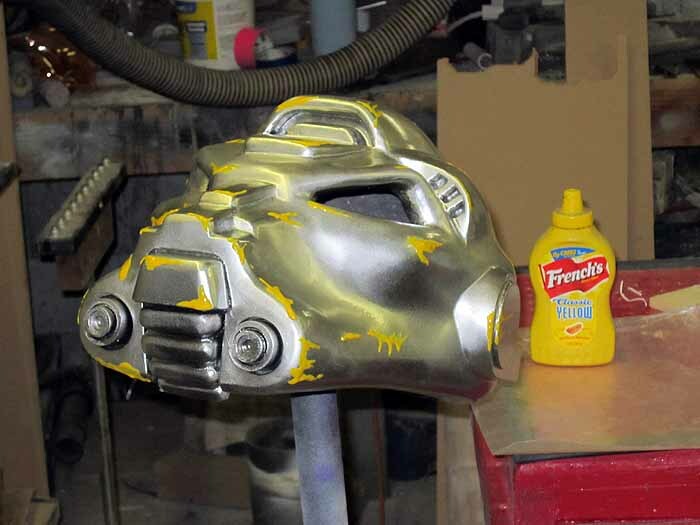 When the primer had dried, I applied more mustard to make scratches that would show through the topcoat to the primer. 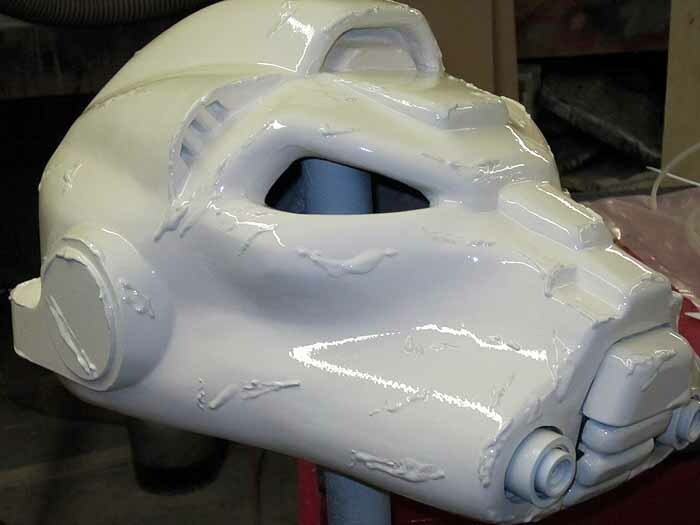 If you're not familiar with blackwashing, you can see the process explained in my build of Boss' helmet from Republic Commando. 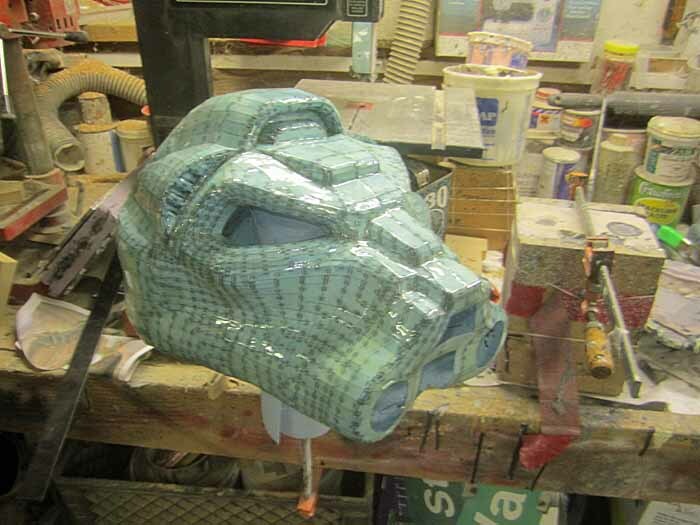 The eyes were formed out of 1/8" red tinted acrylic sheet from TAP plastics which I heated in a toaster oven until it became pliable and then pushed into place with a wad of paper towels until it cooled. This gives them a nice convex look. If you're not comfortable cooking plastics so they emit all of their poisonous chemicals, you could just as easily cut a section out of a welding faceshield from the hardware store or a tinted transparent report cover from the office supply store. With the paint done, you can add some padding by gluing in some upholstery foam from your local fabric store so it fits snugly. 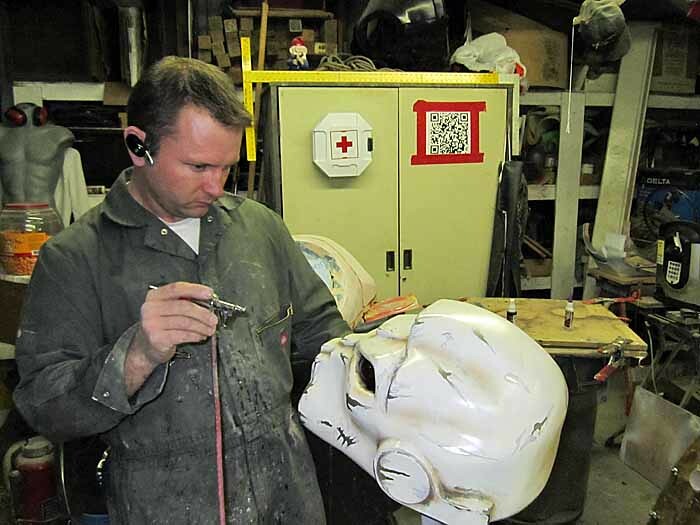 The total cost of materials that went into the helmet itself was somewhere around $45. 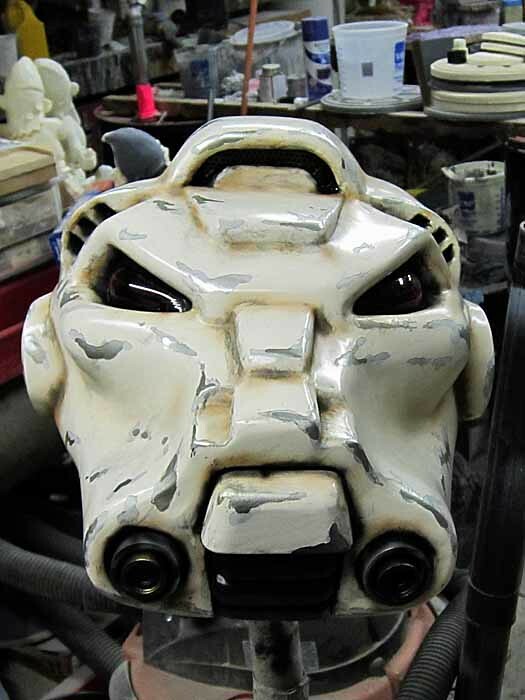 Even the smallest bondo and resin kits you can find in the hardware store will contain enough material to build two helmets this size. If I'd bought all of the paints I needed all at once, they'd be another $70 or so. If I had to buy all of the tools I needed just for this project, add an additional $30 or $40 depending on fluctuations in the world tongue depressor market. Not bad for a finished product that looks at least as good as any of the licensed collectible props I have in my collection. I've got more projects coming along right now. Be sure to subscribe so you don't miss anything. EDIT: If you found this tutorial useful, you'll find more like it in my book, "Make: Props and Costume Armor" available HERE. This is the stuff that Man-Crushes are made of. This is fantastic. All of your stuff is a great read, but the tutorials are the best. 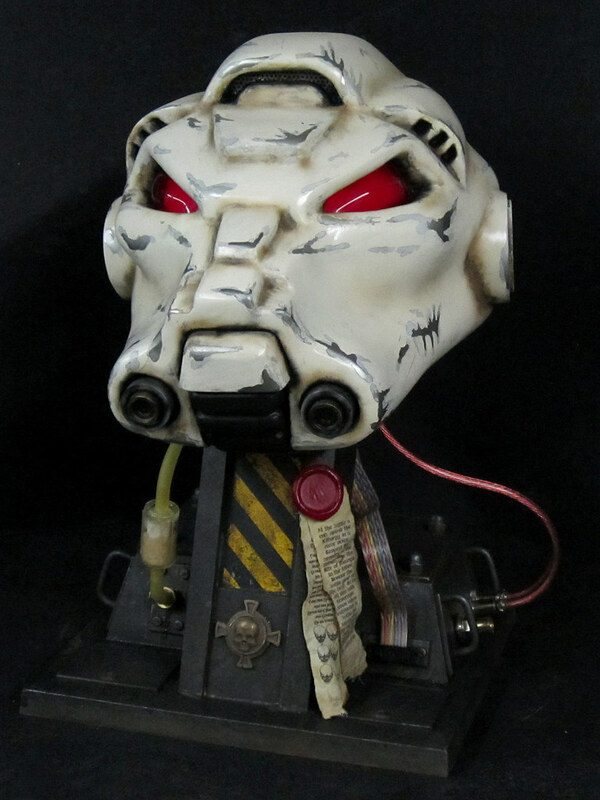 Looking forward to more propbuilding 101.
currently I am working on a full space marine costume, and although I had been going the pepakura way, I have now come to realize I have been doing it all the wrong way, do you think that if I started now I and followed your method as above, would have the whole suit ready in two or three months? great job on the helmet, love reading your blog, keep it up. Unless you make it your full-time job, I doubt you'll be able to finish a full costume in that time frame. Either way, good luck. Finally! A fantastic step by step tutorial. In the future, might there be an article detailing how to "scale" the designs to different dimensions, or how to make the items wearable? My 5 year old daughter is really wanting a Halo: Reach Kat costume, but I'm hesitant due to the issue of scaling it to her frame. In the 2D pull-down menu in Pepakura you can designate the built dimensions of your model. You'll can change the size to whatever you need it to be. I'm not sure why people get hung up on this concept. Use a ruler. Worst case, you'll need to rebuild the paper model if it's sized wrong. 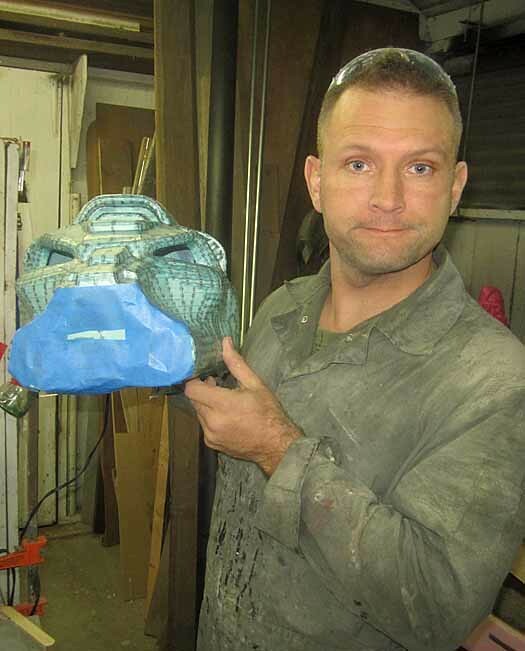 Love the attention to detail on the helmet, I made a HALO helmet with a similar process, but didn't put nearly as much time as I probably should have in improving the finish (it's really polygonal, sharp edges that don't stay sharp with too many coats to bondo or putty). The "Rondo" that you were talking about confuses me a bit. Did you add any MEKP into your mix? 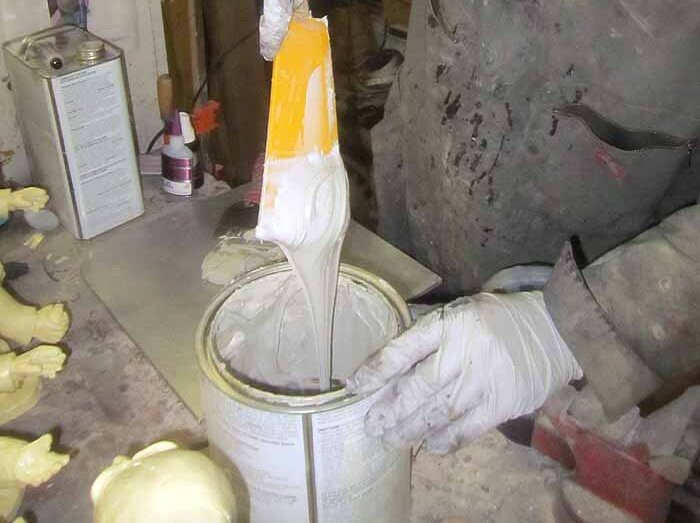 While Bondo and the fiberglass resin you used are both polyester-based, they're promoted differently and use different initiators to start the reaction, so I'd honestly be surprised if it produced the results it did for you without the other initiator. 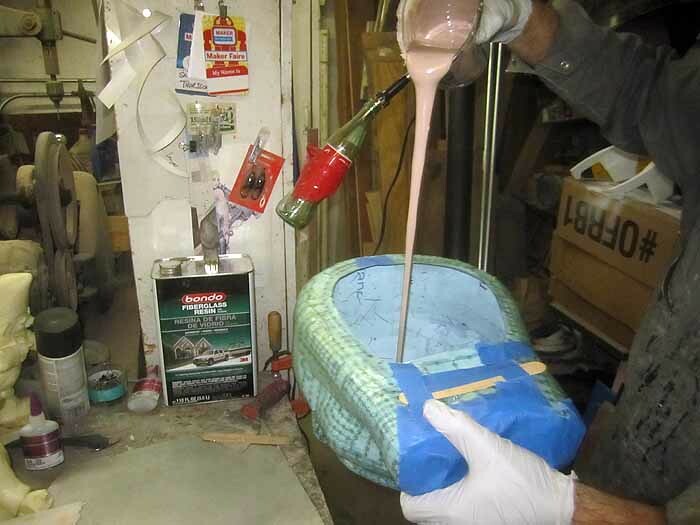 You missed that line in Step 4 of mixing Rondo: "Once you've blended the Bondo and hardener thoroughly, mix up a batch of fiberglass resin that's about the same volume as your blob of Bondo in accordance with the manufacturer's instructions." So yes, MEKP was added to the polyester resin in order to make it go off. I always look forward to seeing your unread articles appear magically in my RSS reader. It's like mana from some sort of a nerd heaven. 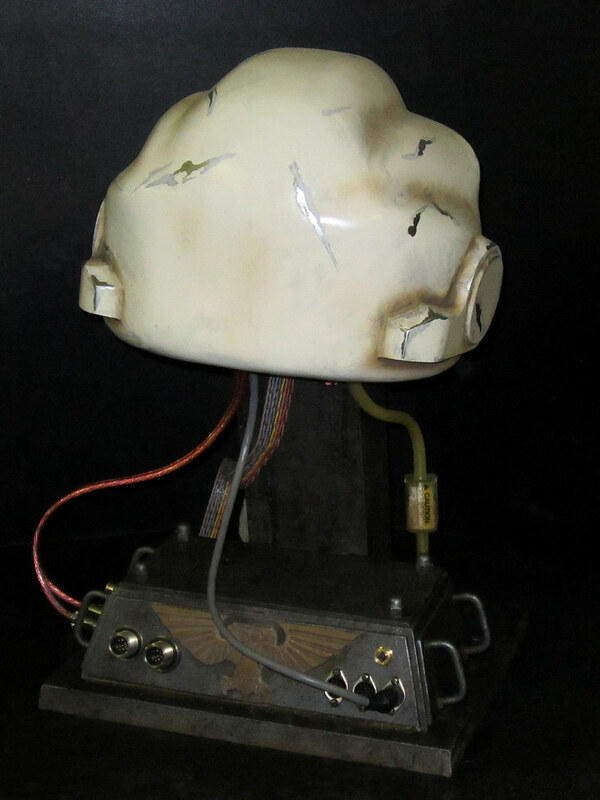 How much time would you estimate that prop took to make? I have worked with paper folding in the past but find the assembly on the nice models overwhelming. Wow... simply wow... This has made me want to do this as well. Thank you for the Tutorial! I do, however, have a question, and maybe I missed it, but how did you do the eye pieces? hi mate!!!! searching the net i found your blog when i saw you it came to my mind "hey i know this guy"!! 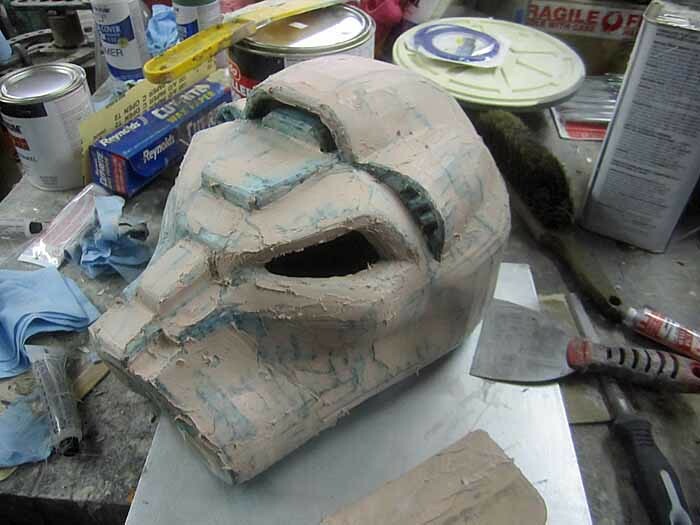 !hahaha i know you from the rpf,i am building an iron man costume but i need a little help with the mold,it's a simple question can i send you a pic to your email so you can give me an idea? is infested with tutorials on the net but your step by step is really excellent!!!! thanks too much i will follow your blog!!!! 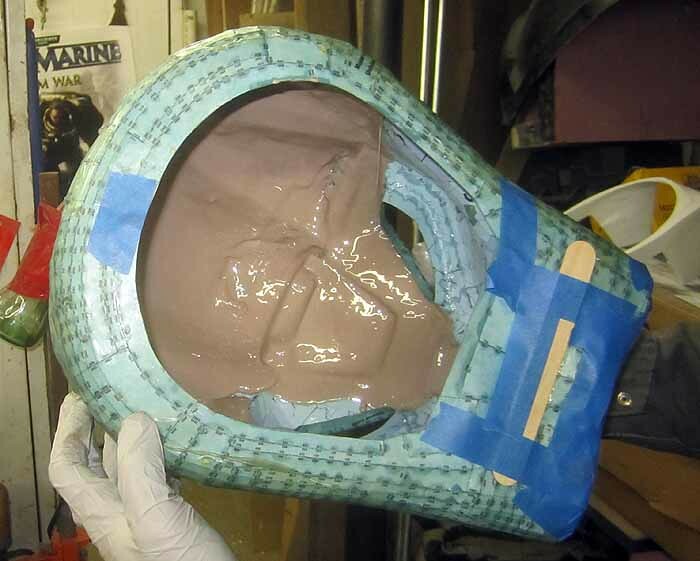 Actually, I've written a couple of how-to articles in this blog about making helmet molds. Look back through the archives and you'll find them. 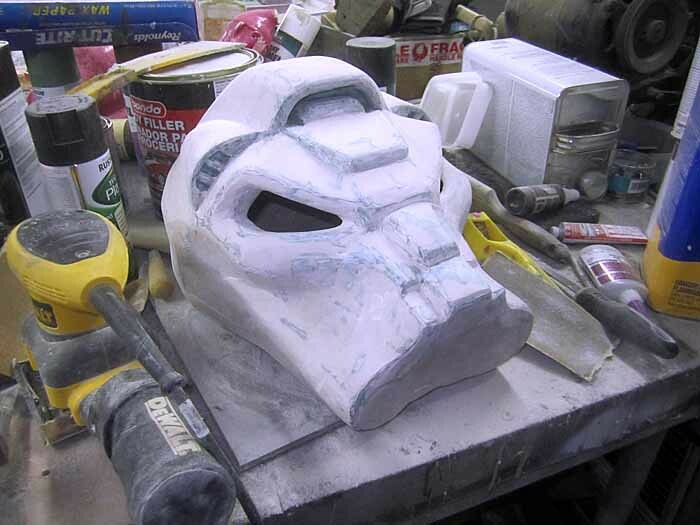 The most applicable one for you is probably my Republic Commando mold. I havea bit of an odd question . What kind of printer do you use? Also, my father and i are working on some nasty yard gnomes thatll hook up as sprinklers....lol. awesome work btw. Give me something to strive for, and the tuts are quite informative. So out if curiosity, where do you get most of your supplies from? But all kidding aside, this is a fantastic tutorial. But can I ask about using Pep? what sort of poly count on my 3D model should I try to achieve before sending it to Pep? Does poly count even make much difference if it gets up there in numbers? I'm not much of a 3D modeller, but I can tell you that the higher the poly count, the more difficult it's going to be to keep the build nice and straight. If you've got any sculpting experience, you really don't want to have the pep model be much more than the "blocking" that establishes the general shapes so you can keep everything in proportion when you go back in and flesh out all of the details. With practice, it'll all get easier. You should make a Big Daddy costume from Bioshock. Challenge? u have managed to inspire my new pc casing. 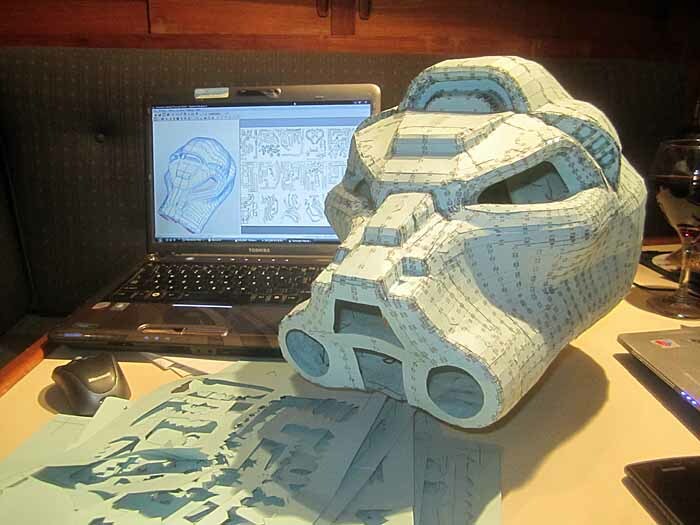 When I put together the paper model of my Aquila MK VII Space Marine helmet I built a bit of the model before completely I scrapped the unfold and did it again myself. My own refold was much easier to accurately assemble and used less paper. 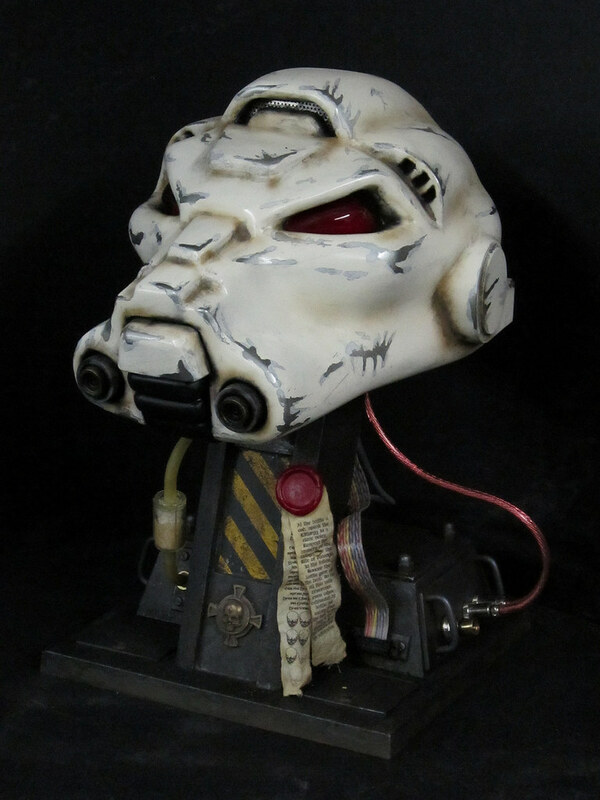 When it comes to this Terminator helmet, though... I don't even know what to do. From your pictures, it looks like we got the same PDO. I started tinkering with a refold, but the asymmetry of the model is already driving me a little crazy. Did you do any kind of refold, or did you just assemble the PDO the way you found it? I almost always end up rearranging the unfolded parts. Because of the highly faceted nature of this model, I redid the unfold several times before I decided that it was good enough. The seams in the model still didn't end up being symmetrical, but I made most of the sections into L-shaped pieces so the additive errors from the pep build would end up correcting themselves along the way. Hey I gotta say this is all amazing and really helpful. I've read many of your different articles here and got really inspired and hopeful I can make stuff too.. But I have a question.. 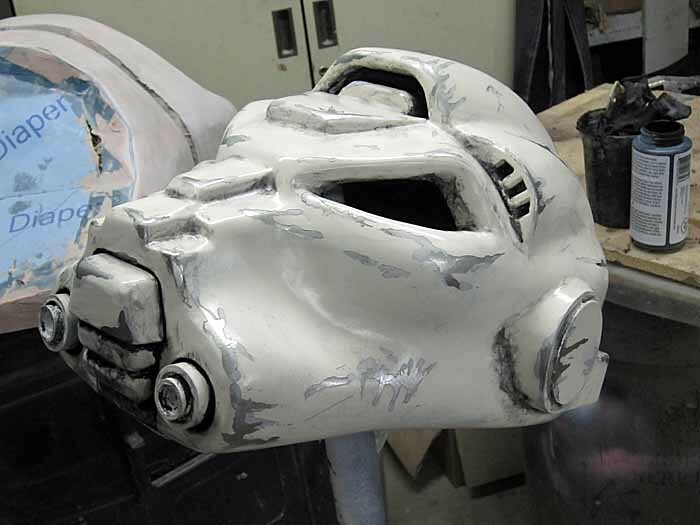 I'd like to do a pepakura Combat Shotgun (Fallout, can be found on DeviantArt) but since the pepakura comes in color, how do I protect the outside layer of it without damaging the colors? As well, since the COmbat Shotgun is a close object unlike a mask, how do I put the bondo in it? I can't think of any way to reinforce the paper model without messing up the colors on the surface. 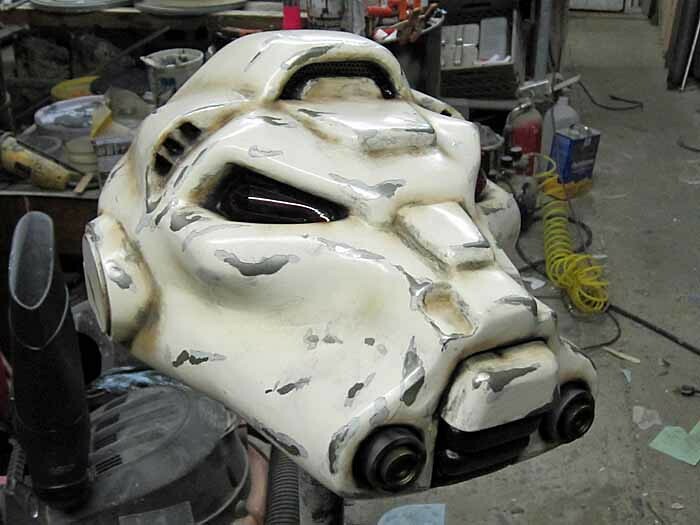 You're going to have to paint it after it's done. Regarding filling the closed model, you'll need to use something less viscous than Rondo. 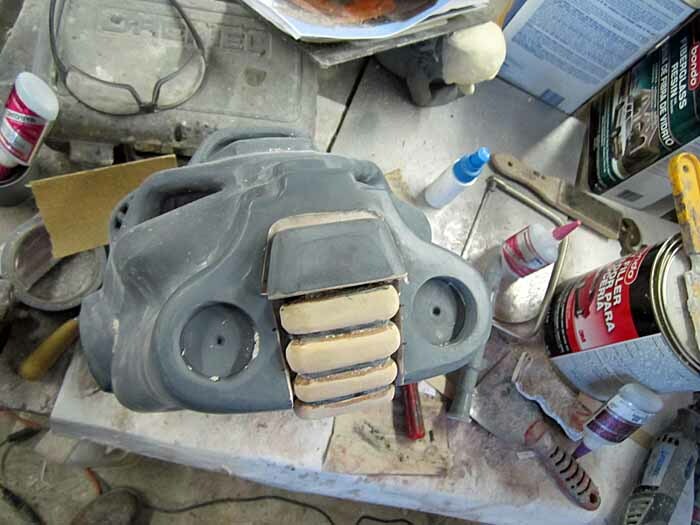 If I was determined to use a pep model to build something like you're describing, I'd probably coat the outside with fiberglass resin as mentioned in order to make it watertight, then once it cures I'd drill a hole in one end and fill it with casting resin. In all honesty, I wouldn't recommend building something like that with Pepakura. It's easier to just carve it out and build it up in wood and styrene. But whatever floats your boat. To speak the truth this is a nice post concerning this topic. I got a pure solution from here. Also I can refer to you all Wasau paper here to get educational helps. Nevertheless will wait for more posts from the blogger. Thanks a lot……. How do you do the sizing in Pepakura when you're ready to print? Amazing work, thanks for sharing. I came across this article while looking for rondo tutorials and it definitely fit the bill. I do have a question for you, regarding the rondo step of your prop; a lot of other tutorials use fiberglass cloth or mat plus rondo, but unless you neglected to include the step, it appears that you don't. Is this something that you've found to be overkill, or problematic in some other way? Hey, I tried contacting you but I think your "Email" button is broken or something. I want to commission you for an airsofter's dream...a unique juggernaut suit (Call of Duty...not Marvel lol). Something terrifying on the modern battlefield and can take a beating while being lightweight but heavy-looking (bulky-ish). Something that will haunt the dreams of my enemies.......think you're up for it? Incredibly descriptive and informative. Looking forward to trying it out for myself. Thank you for sharing your knowledge. 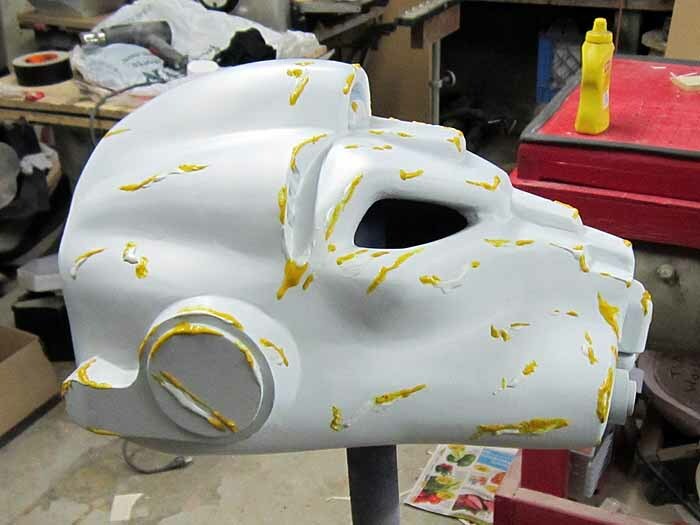 It explains this process in greater detail as well as a variety of other methods you'll find useful when the time comes to paint your armor and strap it all together.